Janet Shapero, a Boston-based artist and close friend of Estelle Brettman (International Catacomb Society founder) will be our guest speaker. She will talk about the impact of their friendship and shared Italian experiences. While showing images of her celebrate Rete-Chromes she will discuss sources of inspiration from catacombs to cathedrals – from stone to light itself. 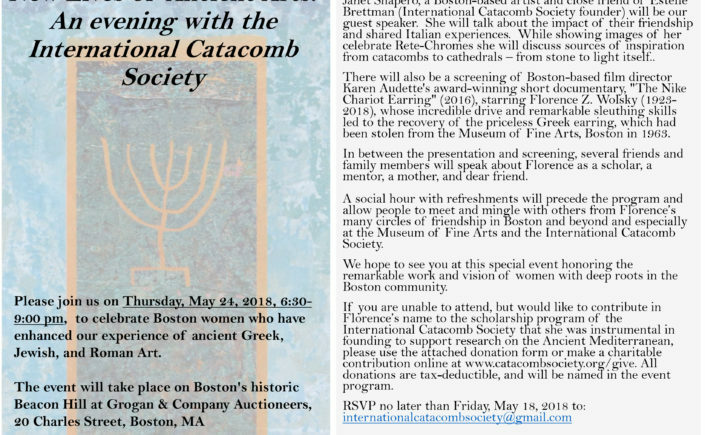 There will also be a screening of Boston-based film director Karen Audette's award-winning short documentary, "The Nike Chariot Earring" (2016), starring Florence Z. Wolsky (1923- 2018), whose incredible drive and remarkable sleuthing skills led to the recovery of the priceless Greek earring, which had been stolen from the Museum of Fine Arts, Boston in 1963. In between the presentation and screening, several friends and family members will speak about Florence as a scholar, a mentor, a mother, and dear friend. A social hour with refreshments will precede the program and allow people to meet and mingle with others from Florence's many circles of friendship in Boston and beyond and especially at the Museum of Fine Arts and the International Catacomb Society. If you are unable to attend, but would like to contribute in Florence’s name to the scholarship program of the International Catacomb Society that she was instrumental in founding to support research on the Ancient Mediterranean, please use this donation form ICSPledgeForm2018 or make a charitable contribution online at www.catacombsociety.org/give. All donations are tax-deductible, and will be named in the event program.